2 in 1 case. Each portion can be used separately. >>360 degree 4-wheels rolling system. >>High quality aluminum finish and construction with reinforced steel corners for extra durability. >>Beautiful new red alligator textured printing finish with red aluminum trimming. 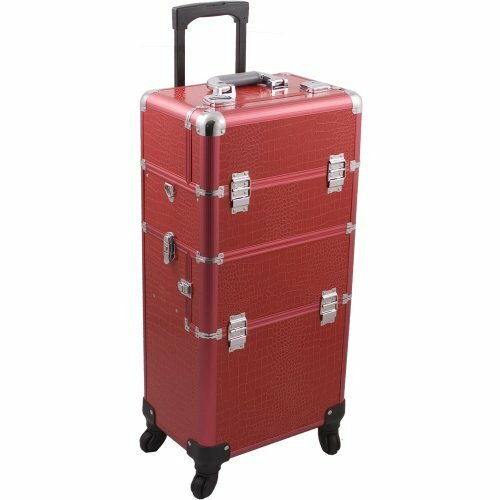 >>Heat resistant exterior material keeps the case cool and protects your cosmetics. >>Retractable/telescoping handle for extra durability with inline skate wheels for easy rolling. >>Heavy duty handle for added comfort and grip. >>Extra lid with removable mirror for bottom makeup case. >>Three easy slide extendable trays with spacious interior with removable custom tray dividers. >>Lock and key system for added security. >>Removable tray w/ajustable dividers in lower storage. >>Telescoping handle fully extended height: 40". >>Large extendable tray dimension: 12.25" x 4" x 3". >>Small extendable trays dimension: 12.25" x 4" x 1.25" each. >>Top empty space below trays dimension: 14" x 8.25" x 5.25". >>Top section case dimension: 14.5" x 9.5" x 10". >>Removable tray botton section dimension: 13.75" x 8.5" x 3.75". >>Bottom hollow space dimension: 14" x 8.75" x 12.75". >>Bottom case overall dimension: 14.5" x 9.5" x 21.25". >>Overall case dimension: 14.5" x 9.5" x 31.25"
If you have any questions about this product by Hiker, contact us by completing and submitting the form below. If you are looking for a specif part number, please include it with your message.